Billed as a family musical, the adaptation of Anne of Green Gables playing at Sonoma Arts Live fulfills that appellation with its homespun, innocent and charming warmth. Commendable acting, particularly that of Melody Payne playing Anne, along with attractive spectacle and staging make for a pleasant evening spent in 1908 Avonlea. Based on the much-loved novels of L.M. Montgomery, Janet Yates Vogt and Mark Friedman’s musical unfolds in episodes highlighting the best-known scenes from the books. Spunky orphan girl Anne (Payne), with her flaming red hair and freckles, is adopted somewhat by accident by siblings Matthew and Marilla Cuthbert (Bryan Hendon and Shirley Nilsen Hall), who originally wanted a boy. Anne’s natural exuberance and generous spirit earn her way into their hearts and a forever home at Green Gables farm. After early missteps and mishaps, Anne also wins over schoolmates and neighbors, eventually becoming a beloved citizen for the town. Ron Severdia. Photo by Argo Thompson. One of the most hauntingly beautiful theatre pieces I’ve seen this season is Duncan Macmillan’s Every Brilliant Thing, currently running at Left Edge Theatre. Thoughtful without being sentimental, an antidote to holiday treacle without being crass, it’s a memorable and moving show that warms the heart and affirms life, even with sadness, depression, and death in the bargain. Solo actor Ron Severdia gives a stirring performance that feels fresh and familiar, capturing both the comedy and the pathos in an intriguing tale. Tone is important for this piece, and Severdia hits it just right—there’s humor, joy and laughter, along with a very straightforward, natural delivery that invites us in and avoids the maudlin. He tells the story, in first person, of a man whose mother attempted suicide when he is seven years old. His father tells him, “your mother has done something stupid,” and the boy pieces together scant bits of information to try and understand what has happened. His young mind hears, accurately or not, that she didn’t feel there was any thing worth living for. This leads the boy to create a list, hoping it will cure his mother’s depression, a comprehensive list of “every brilliant thing” that makes life worthwhile. David Boyll and Russ Whismore. Photo by Robin Jackson. Arguably playwright Neil Simon’s greatest hit and the number one theater comedy of the 20th century, The Odd Couple, endures, surviving productions of every stripe to share its apparently timeless humor with audiences again and again. The play premiered in 1965, and the script occasionally reveals its dated origins, but not in a way that mars the comedy—Simon’s genius creates a world of identifiable and genuine characters no matter the era or circumstance. 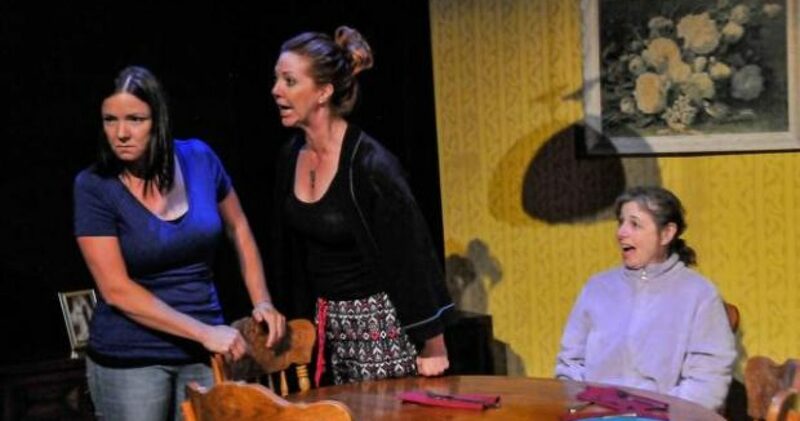 The current production at Ross Valley Players falls somewhat short of the mark, as it’s less funny than one would hope, but it manages to be entertaining overall with some fortuitous casting. The Odd Couple focuses on two middle-aged men, recently divorced Oscar (Russ Whismore), in his eight-room Manhattan apartment, and his friend, newly separated Felix (David Boyll). When the weekly poker game at Oscar’s pad gets interrupted by Felix’s suicidal threats following his eviction from home, Oscar is prompted to offer Felix a temporary landing, which Felix gratefully accepts. Irish playwright Conor McPherson, called “quite possibly the best playwright of his generation” and a “true poet” of the theatre, is noted for plays featuring believable, ordinary folk mired in difficult circumstances, working-class stiffs barely getting by and struggling with life’s challenges, and plots infused with a pervasive malevolence. Yet his plays famously are also touched with the extraordinary—a radiant sense of something unnameable, something larger than ourselves that pulls towards redemption, reducing the struggles to bearable noise. His 2013 New York Drama Critics Circle Best Play The Night Alive has that luminous redemptive edge in spades, especially in the glowing, exceptional production currently gracing the stage in Sebastopol at Main Stage West. Tommy (Anthony Abaté) is already in his fifties, but still hasn’t managed to find his way, subsisting on random odd jobs and living in a room in his uncle Maurice’s house. We see in the shabby room the detritus of a man’s meager existence—scattered clothes, accumulated trash and newspapers, mismatched crude furnishings, a makeshift sink and tiny toilet room. At opening, Tommy has stepped out for fish and chips but returns with a young woman nursing a punched nose. Aimee (Ivy Rose Miller) insists the man who punched her was not her boyfriend, but Tommy is skeptical. He offers her tea and a place to sleep if she needs it, assuring her he’s different and would never hit a woman. Dean Linnard & Melissa Claire. Photo by Katie Kelley. Just when you think you’ve seen it all, theatrically speaking, who shows up on stage but a foul-mouthed, Satanic, and raunchy hand puppet named Tyrone, who unleashes a violent but hilarious reign of terror on the world around him—that is, around the poor unsuspecting teenager Jason, whose right arm seems possessed when Tyrone is on it. Robert Askins’ madly funny and irreverent play Hand to God gets a terrific airing with a strong cast at Left Edge Theatre, featuring a mind-blowing tour de force performance by Dean Linnard as the teen and his demonic alter-ego.